By accessorizing your Guardian Booth, you can customize your work space, highlight your business, and make a statement. 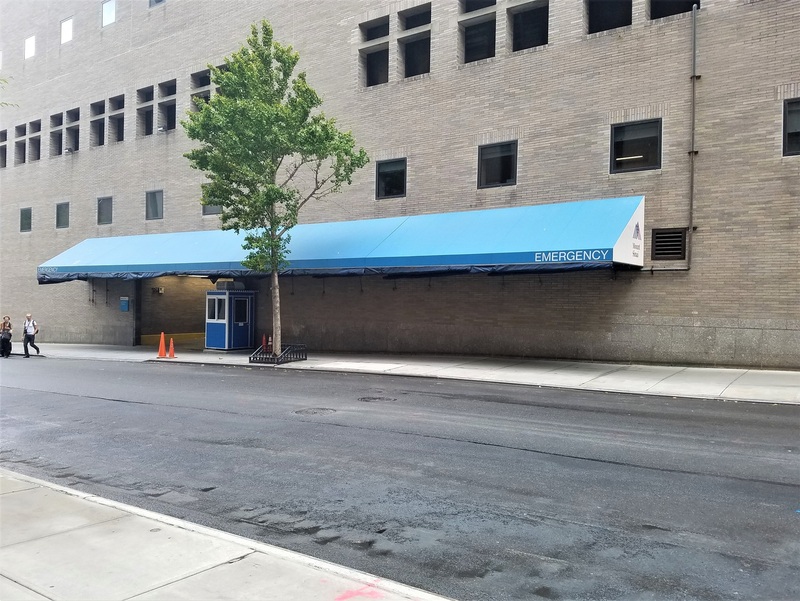 Having a guard shack, parking booth or ticket booth will provide your employees with the perfect environment to operate efficiently, but there are also options to enhance your presence and make your booth more functional, comfortable, and mobile. By adding the right accessories, you can transform your booth into the perfect work environment. There are several ways to accessorize the outside of your booth to make it fit your specific needs. Make a statement with your Booth! The standard color for a Guardian Booth is blue. However, booths can be customized with a 3M 1080 vinyl protective wrap in a variety of colors to add a glossy look that won’t scratch as easily as metal and won’t fade as easily. Choose from any of one hundred colors. Vinyl wraps add a glossy look to the outside of your booth to help maintain a “brand new” appearance. We can add just about any graphics to the exterior of your booth from a grand design to information about your business. 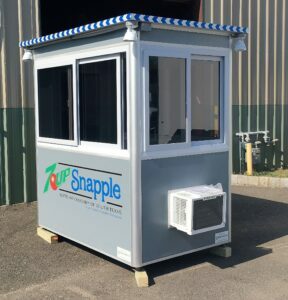 Booths can display company logos, hours, pricing, or other information on the exterior. Tinted windows increase your privacy. They allow users to maintain awareness of their surroundings without being seen from the outside. In addition to masking movements, it reduces heat inside the booth and blocks potentially harmful UV rays. Windows can be tinted with a mirror tint or 15% black tint. We can outfit your booth with a variety of electrical options to fit your specific needs. An exterior electrical disconnect switch makes it easy to shut off all power to the unit from the outside. Exterior electrical disconnect switches are rated for 30 Amps, but can be upgraded if needed. 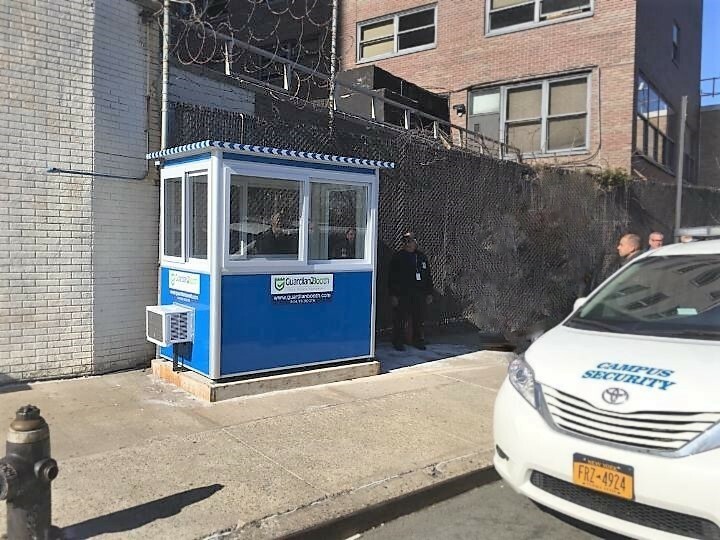 A well-lit guard booth can be a deterrent to trespassers. By adding outside LED spotlights, you can also light up the surrounding area at night and make the guard booth even more noticeable. LED spotlights can be wired and installed in the corners, and swivel to point in any direction. Adding a flatbed trailer mount or wheels can make moving a snap! 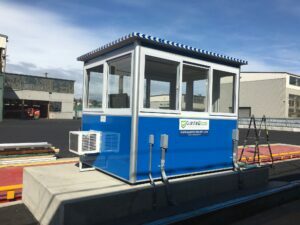 Flatbed trailer mounted booths are great for large premises and temporary work sites where the booth needs to be relocated frequently and moved around the property. Smaller booths can also be fitted with caster wheels to be moved around on a parking lot or inside a building. 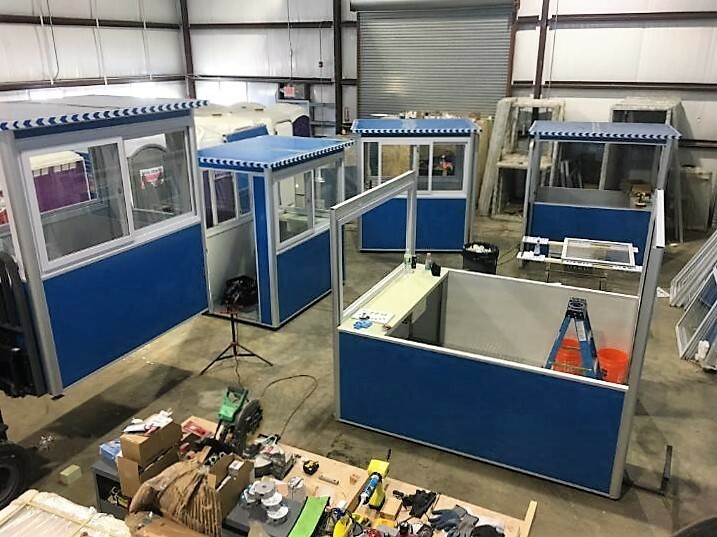 All of our booths can be mounted on a Flatbed trailer and moved by connecting the front tow hitch to any vehicle equipped to tow. Our flatbed trailer booths are equipped with a 3500-pound idler axle, 15’ tires, 2’ ball couplers, stabilizing jacks in each corner, and a 4-foot hand rail around the rear of the trailer to the booth entrance with a step down from the trailer to ground level. If you have a specific use in mind, we will work with you to come up with a solution. For example, you may want exterior shelves for customers to set their purse or wallet down when making payments, or while you check identification. You may prefer an intercom system rather than have your employees slide open doors or windows. Buzzers or doorbells can be installed to alert your guards when visitors are outside. If you can think of it, we can make it happen. You may need to add specific accessories depending on the job you’re doing. Here are some of the more common items that customers request. We can accessorize your booth with a number of electrical and connection options. Duplex Ethernet ports and phone lines can be pre-installed in conduit to make communication quick and easy. You may want to consider Wi-Fi hotspots as an alternative to a hard-wired connection. A breaker panel box provides central access for electrical hookup that can be distributed as needed and include a circuit-breaker to prevent power overload. 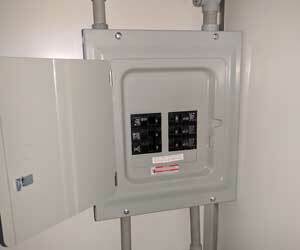 Electric panel boxes are rated for 100 Amps with 6 circuit breakers, but can be upgraded as needed. Your employees may spend a good part of the day in their booth. You’ll want it to be as comfortable as possible. Consider adding air conditioning or heating to improve working conditions and avoid the safety hazards associated with portable fans or heaters. Built-in air conditioning units and baseboard heaters give employees control over the temperature on even extreme days. Air conditioning units can be built into the wall and have a digital screen and remote control. Baseboard heaters can be built into the booth with a dedicated thermostat next to the light switches. Work spaces inside the unit can be outfitted to your workplace needs. Additional desk, countertops, and seating configurations can be added. Metal lock box drawers can help protect cash, tickets, or other valuables. Larger booths can also be equipped with bathrooms. Guardian Booths can be equipped with a variety of accessories beyond the standard options. Additional options include fixed glass windows versus sliding windows, sliding or swinging doors, solid walls, additional doors, transaction slots, numbered key hooks, counters, metal lockers, and more. Other options to consider may include traffic cones, cigarette containers, trash containers, flashlights, and fire extinguishers. These items can be customized into your booth at Guardian Booth. For pricing information, visit our pricing page or get in touch with us for a custom quote for your specific needs.